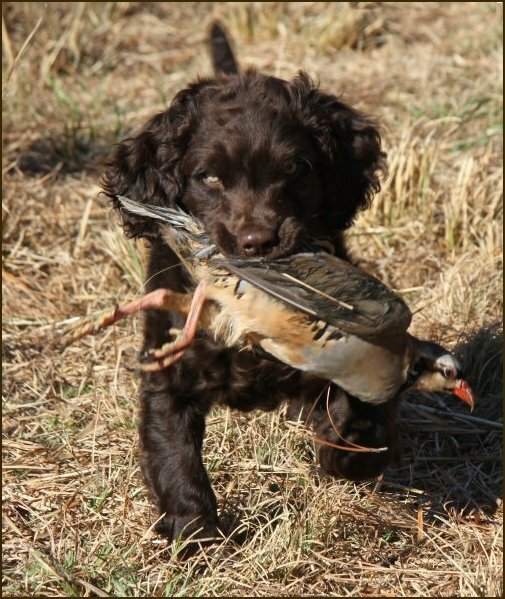 (GRHRCH UH Just Ducky's Justforkicks OCH 06, 08, 09 x HRCH UH Justasipofmoonshine "April"
Boykin Spaniel puppy buyers beware - if you want a Boykin Spaniel Society registered Boykin ask to see the BSS blue registration papers before getting your pup. Some breeders are only registering their litters with UKC and AKC. If the puppy is not BSS registered you cannot register any future puppies with the BSS and you cannot run your pup in BSS field trials. 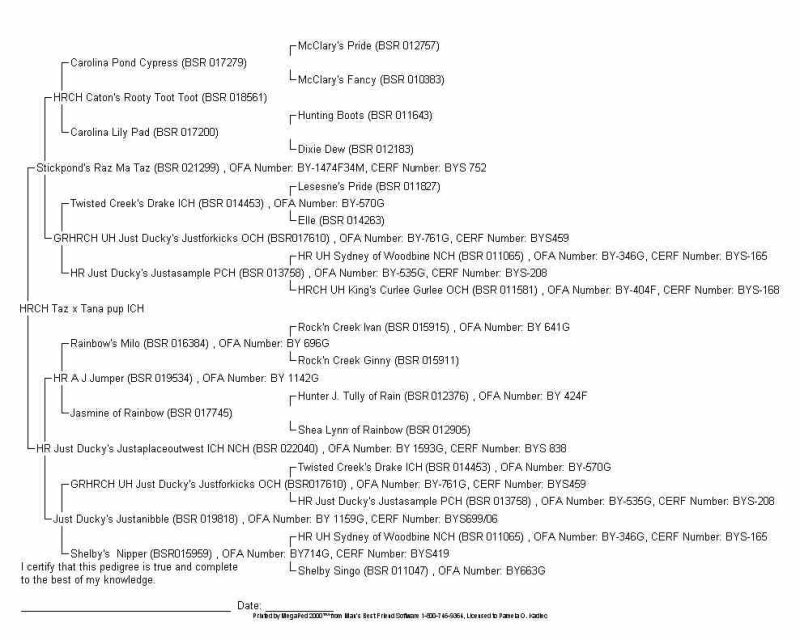 Policy regarding puppy ads - only OFA/CERF certified litters will be accepted for advertising on this site. AND, the breeder must stand behind their puppies with a guarantee. As of January 1st, 2004, all breeding pairs must be OFA heart -cardiologist- certified as well as hips and eyes. 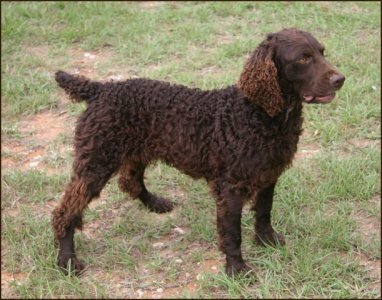 If you are looking for a puppy please contact the Boykin Spaniel Society. (Adult dog ads are not affected by this policy.) Thank you. I ask that all advertisers read my article on buying a puppy and stand behind their decision to breed. I ask that all potential puppy owners read the article listed above in order to be able to ask the right questions and make an informed decision. 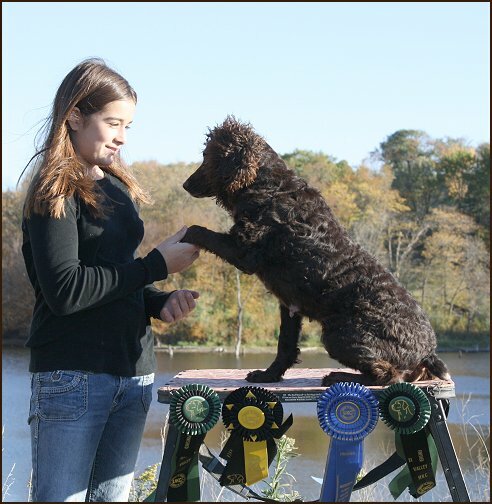 We all want what it right for these great little brown dogs and strive to do our best to improve the breed. If you see pups that are not registerable, the usual reason is that there is too much white on the dog. This does not demean the temperament or huntability in any way. If you are looking for a good field or house companion but are not interested in competition trials or breeding, these pups can be a great deal. Dam: HRCH Just Ducky's Justaplaceoutwest - "Tana"